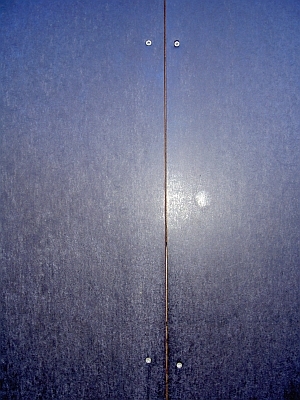 A sufficient number of film coated plywood sheets. The sheets have a standard dimension of 1.25m x 2.50m. For apparent reason you should use the waterproof bonded variant of the sheets. 2.50m is a well usable height for a box, so that you don't have too much cutting scrap from the sheets. The sheets are available in different thicknesses, you shouldn't take the overly thin sheets but as well you needn't use the most solid model with 21mm thickness or similar. 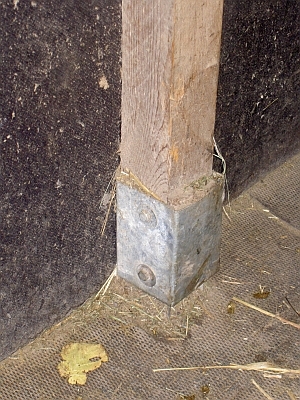 The sheets can be easily and quickly bolted down firmly adjoining, as can be seen on the following picture. A corresponding number of rectangular wooden piles, of course 2.50m long, too. We made good experiences with an edge length of 8 or 10cm. 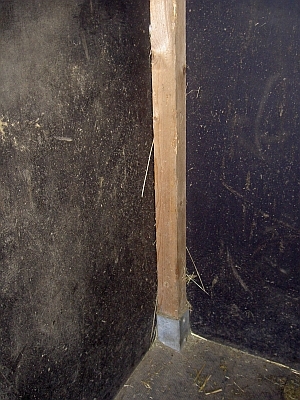 The poles serve as pillars at the corners of the box and as intermediate and fixation pillars at the joints of the film coated plywood sheets. The same number of impact mounted ground cartridges. You should absolutely refrain from directly entrenching the poles into the ground, they will be rotten after a small number of years. If on the contrary the poles are placed inside ground cartridges much less humidity reaches the wood and it can dry up regularly, you will get a much better durability. An additional number of beams, used for the jointing of the edge and intermediate pillars at their top. This way the box receives a stiff frame. Besides auxiliary beams are used as cross-beams on which the roof will rest. The cross-beams hereby should be placed orthogonally to the folding direction of the trapezoid roof, this way you will get a smoothly walk-on-able roof. The bought sheds mentioned above do support the roof only insufficiently, you can walk on them only with great care or not at all, which is alway very tedious for us. During autumn lots of foliage falls onto the roofs and you have to remove it every now and then to avoid clogging of the eaves, etc. A large number of sturdy sheet steel angles. You use them to interconnect the horizontal and vertical beams. This way the box gains additional stability and our self-constructions so far survived every storm. A more or less huge pile of screws. On the one hand you need a batch of small screws. 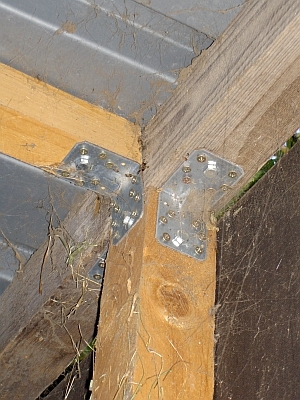 These are used to bolt down the film coated plywood sheets to the beams (see picture above). On the other hand you need a batch of larger screws for screwing the sheet steel angles to the beams. A sufficiently large piece of troughed sheet as the roof incl. the associated screws. The screws are a type specifically intended for the mounting of troughed sheets, so called roofing screws. They possess a premounted washer, holding a seal disc. When tightening the screw it will automatically seal the drill hole in the roof, yielding a rainproof construction. Sturdy rubber mats for the floor of the boxes. 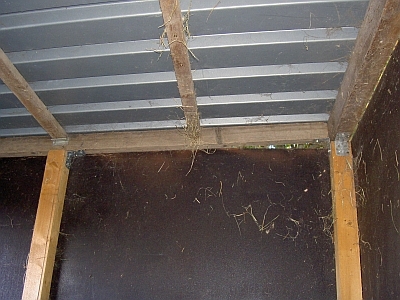 Boxes without mats inside are almost impossible to keep clean and not really a pleasure for the horses. From all these ingredients a rugged box can be build with acceptable effort. 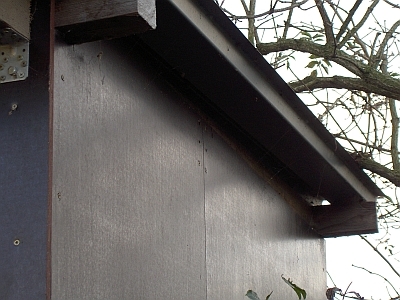 Don't forget to include a small bent of the roof to drain rainwater to a distinct side. If applicable you may mount a small gutter and collect the accrued rainwater in gardening barels. As our open stable horses are accustomed to enter and leave their boxes at liberty we did without any box doors right from the start. 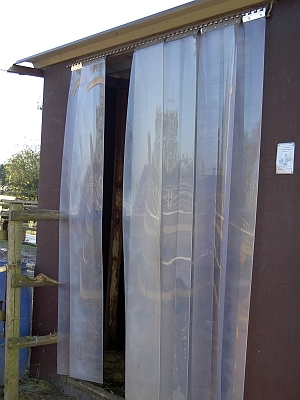 However, on those boxes with an entrance towards the weather side we mounted a PVC strip curtain, keeping off too much humidity from the boxes in case of rainfall. Well, after our horses have a rugged abode now we can proceed to the next topic, riding arena and paddocks.